I’ve been obsessed with organizing the pantry in just about every house we’ve lived in. Sometimes I went a little over-board and labeled everything. Everything. After my family told me they knew that was peanut butter and they didn’t need me to label it peanut butter, well that’s when I decided labeling everything wasn’t quite necessary. We’ve been in our new house for 3 weeks now and at first everything was just crammed into the pantry. After a little shopping at my favorite store – Target! – I purchased a few baskets and let the pantry organization begin! While I still want to make some changes, it’s at least pleasing to the eye and we can find everything. (Without me labeling it too! Shocking.) Although I know HGTV won’t be calling any time soon to have my pantry featured in their magazine (gosh I love their magazine), it works for us. 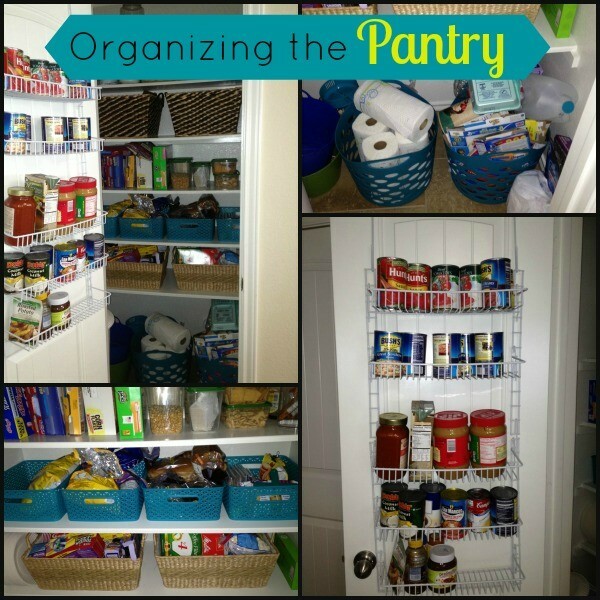 Here’s how the process of organizing the pantry went. 1. 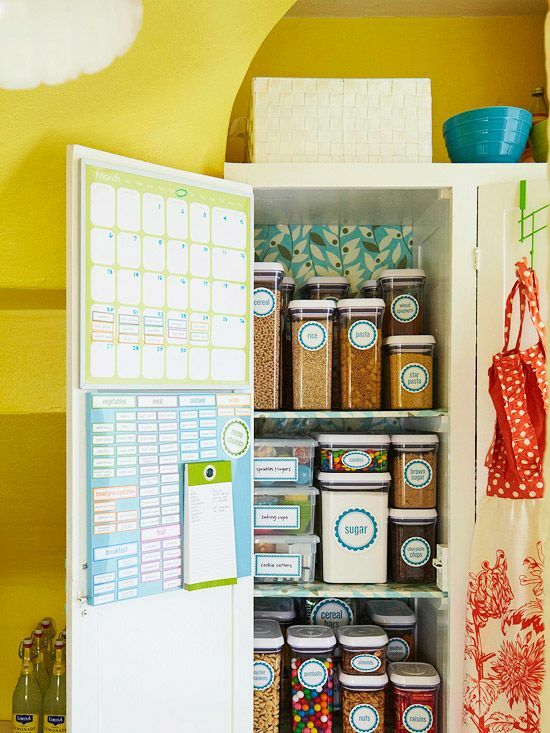 I pinned about 1,000 (okay, maybe 20) pantry ideas. I’ll never forget one of my first days on Pinterest. I was looking at ideas for organizing the pantry and my then 8 year old asked me what I was doing. I told him I was checking out this thing called Pinterest. Little did I know the obsession that would soon be released! Here are a few pantries I pinned and where I got some inspiration. 2. Measure the shelves and go shopping. Be sure to measure the depth and length of your shelves before you go shopping. I already had several wicker baskets I wanted to use, but there were some plastic baskets from Target I also wanted to use. I’ve had my eye on them for quite some time. I’ll probably replace the wicker baskets with all of the plastic ones from Target, but this works for now. 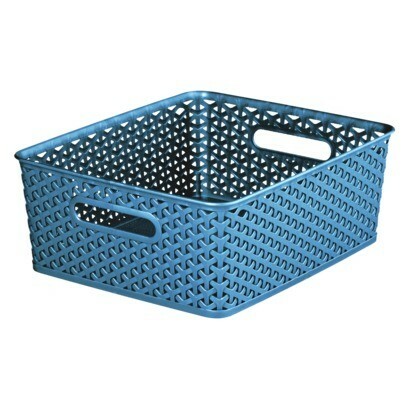 I’m slightly obsessed with the Room Essentials YWeave baskets. They have some great sizes and colors to choose from. I also knew I needed more shelf space available in my pantry and purchased an over the door pantry organizer. Very smart purchase indeed! It freed up quite a bit of space. I also wanted some new storage containers for snacks. I’m still on the look out for just the right ones. 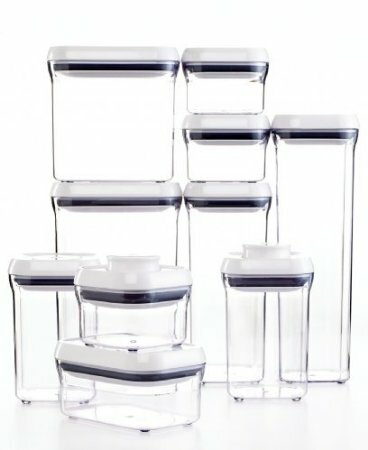 I purchased an affordable set from IKEA for now, but I have a feeling I need to start saving for the pricey OXO ones. I’ve heard nothing but good things about these. We recycle, so I needed a container that could be rinsed out. I decided on the Room Essentials plastic tub you see on the pantry floor in the picture above. I also bought one for paper towels. 3. Empty out the contents of your pantry and group like items together. If you haven’t done this in awhile, you’ll be amazed at all of the unnecessary junk you’ve been keeping. Get rid of expired food, stale food and anything else you don’t need/want anymore. 4. Map out where you plan to put everything and fill those containers. Everyone is different, so map out how you want to set up your pantry according to your family’s needs. Some of you may need the snacks in a place where your kids can reach them. Others may want them where they can’t reach them. I put most used items on the two middle shelves and items less used up top. I also have a basket for baking needs and a basket for baking mixes. 5. Put everything back in the pantry. This is the fun part. Now that you have your containers purchased and filled, the pantry cleaned out and you know where everything is going to go- it’s time to fill it! 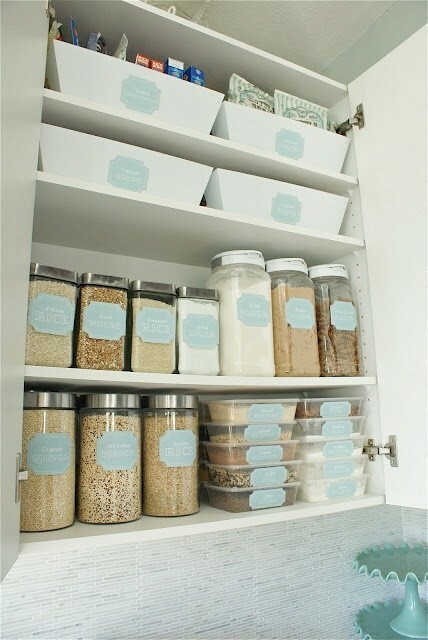 Don’t get discouraged if you have to change a few things after implementing your new pantry organization. As with all organization systems, it’s a process. How’s your pantry looking? Does it need some sprucing up? Getting your pantry in tip top shape before the kids go back to school is the perfect timing!